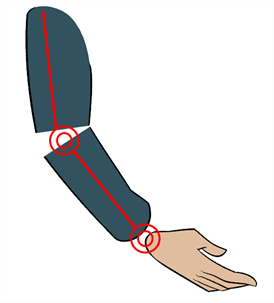 When you want one part to follow another part, such as the forearm following the arm, you can attach the layers one to the other. For example, you can attach the forearm layer to the arm layer without having to encapsulate the forearm into the arm layer. 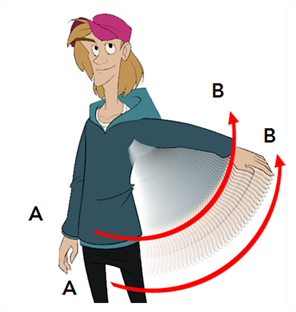 They will still be parented, but you can access the forearm directly without having to enter the arm layer. The advantage of parenting layers is that the child layers will follow the parent smoothly without having to select them or create a series of keyframes. The disadvantage of parenting layers is that you are not able to move the parent independently of its children, since the child layers receive all the transformation information from their parent. 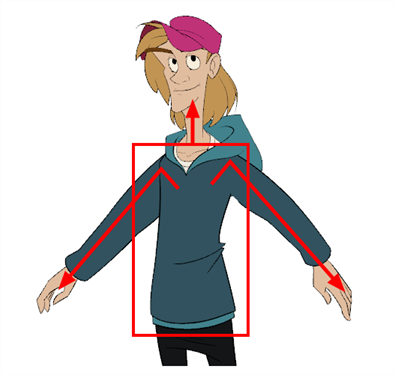 Parenting layers, such as the arms and legs, and allowing the torso and hips to be independent from them is often a good solution. To attach one layer to another, you must drag the desired layer onto the other one in the Timeline view. Harmony offers powerful techniques to create hierarchies between your layers without having to encapsulate layers into each other. These techniques are a great improvement over the less efficient and time consuming method of creating parenting between your layers by inserting symbols into other symbols. Therefore, rigging with symbols inside symbols is NOT recommended.